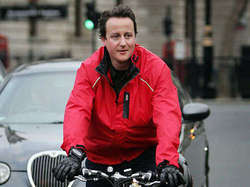 The Evening Standard reported yesterday (now picked up by the Mirror) that a pedestrian was angered by David Cameron edging through the red lights on his bike. Yes Cameron was breaking the law and he more than anyone should be careful about that, but I'm with him on this one. I don't quite accept that bikes should be treated exactly the same way as cars. They are small, light and agile. I once hit a schoolgirl at 25mph when she jumped out in front of me. She merely suffered an embarrassed blush in front of her friends and a bruise probably emerged on her calf later. I on the other hand did a full flip in the air and hit the ground hard in front of moving cars. In fact, not only was Cameron's behaviour unlikely to endanger the angry pedestrian but it was likely to be in the interests of his own safety. A TfL report on cycling has shown that women are twice as likely as men to be killed by large vehicles... because they are more likely to stick rigidly to the white lines and red lights. Men tend to edge forwards so that they can get away quicker, and therefore avoid being creamed by a lorry or bendy bus turning left. Having been to a few crazy cities in South East Asia recently I'm starting to wonder if the masses of road paint, signs and fences in Britain do more bad than good by slowing our reaction times and leaving no room for initiative. The danger of reducing people to simplistic robots were exemplified to me neatly last weekend when I was told off by a moody Corporal for falling myself out of a line of running TA soldiers to get a rugby ball out of the middle of the road. Never mind that the ball could have caused a car accident, if I was injured whilst under the army's care it would have caused him "tonnes of paperwork".